Yarmouth is investigating possible involvement of its students after emotional game. READFIELD — The top-seeded Maranacook boys soccer team dropped a tough 3-2 double overtime decision to Yarmouth in the Class B South championship Wednesday night at Ricky Gibson Field of Dreams. 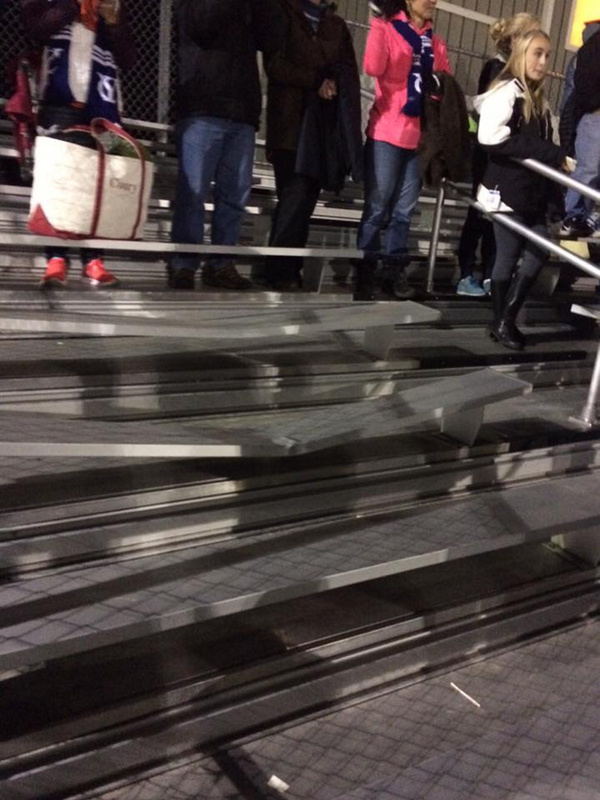 Afterward, it was revealed a row in the bleachers had been damaged during the emotional game. Maranacook Athletic Director Al MacGregor said the damage likely occurred when spectators were standing or jumping on them. Yarmouth athletic director Susan Robbins said the school is investigating any possible involvement of Yarmouth students. The bleachers were installed before the 2009 season as part of field renovations paid for by community fundraising and the Make-A-Wish Foundation in support of Ricky Gibson III, who died of an inoperable brain tumor in April 2009. It was Gibson’s dream to have lights and bleachers on the field.